A library in the center of a raging fire north of San Francisco is still standing, but its doors will be closed until further notice, the Lake County librarian announced this week, adding that all fines and fees will be waived. In a statement, Lake County librarian Christopher Veach said that while the Middletown Library is closed, the other branches, in Lakeport, Clearlake and Upper Lake, remain open. He invited anyone to come use those libraries' computers to check email and communicate with loved ones during the fire. All those branches have free WiFi, he said, and power outlets to charge devices. 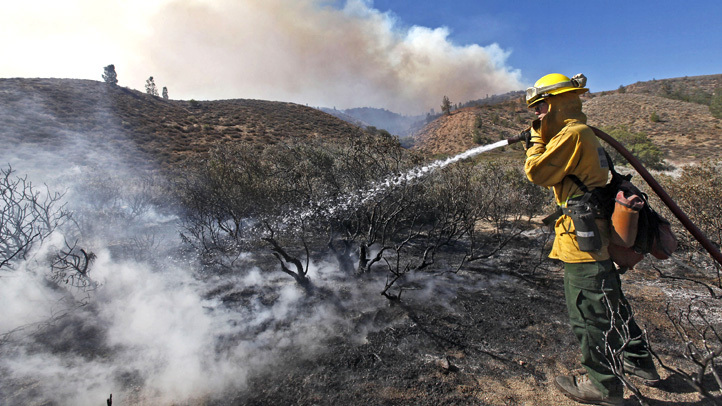 As of Wednesday morning, the Valley Fire, located less than 100 miles north of San Francisco, had charred 70,000 acres and was 30 percent contained. It has been burning since Saturday. Fueled by drought, the Valley Fire has consumed more than 95 square miles — larger than the cities of San Francisco and Oakland combined, injured four firefighters and threatened 9,000 structures. It has displaced more than 13,000 people who flooded nearby evacuation centers, including Kelseyville High School, Napa County Fairgrounds, Highland Senior Center and Big Valley Rancheria Gymnasium.